Roundheads RUFC proudly promotes Stonewall’s Rainbow Laces campaign. Stonewall’s Rainbow Laces campaign allows everyone involved in sport to show their support for LGBT equality and inclusivity. Homophobia, biphobia and transphobia remains a big problem in sport. Seven in ten fans have heard homophobic abuse on the football terraces, and shockingly 60 per cent of gay and bi men, and 40 per cent of lesbian and bi women, expect to experience discrimination if they were to take part in a team sport. The Rainbow Laces campaign Seeks to raise awareness of this and encourages all sports teams, players and supporters to take a stand. It has inspired sports bodies and organizations across the UK and the world, with the national teams rugby teams of Canada, England, France, New Zealand, Wales and Scotland joining the campaign, and showing their support to former Wales international, Gareth Thomas, recently the victim of a homophobic attack in Cardiff. 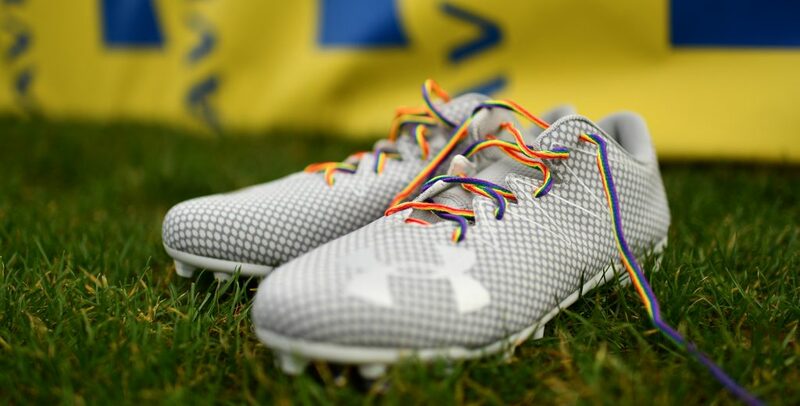 Hull Roundheads players will be proudly wearing the rainbow laces in all of their upcoming training matches – and we encourage all local sports teams to display their true colours and do the same. Hull Roundheads RUFC was founded in August 2018 to create a ‘safe space’ a in which gay, bisexual and trans players, and our ‘straight allies’ can feel free from the homophobia and sexism prevalent in so many sports and just be themselves. The team is part of a truly global community, a member of International Gay Rugby (IGR): a federation of inclusive rugby teams where men of any gender, sexuality and race can come together for the love of the sport and get into rugby. Of course, rugby has often been more accepting and successful in combating homophobia than football in any case; but as our trans members attest, there’s still a way to go. Just as importantly, this team is inclusive regardless of ability or experience – it’s not just about sexual diversity – and that makes it so much more fun to be a part of. It’s down to everyone of us to be an active ally to lesbian, gay, bi and trans people in sport. Sport has the power to forge teams that inspire their players, their supporters and their communities. Sport has the power to bring us together. Be the first to comment on "Roundheads RUFC proudly promotes Stonewall’s Rainbow Laces campaign."